The leather jacket is a versatile cover-up what can be worn from winter to summer months, in other words saying, it's a cool girl's trans-seasonal wardrobe piece. You can either recreate a model-off-duty look by teaming your denim shorts/ pants with a leather outerwear, play with proportions, make it look ladylike, add LBD, awesome prints and many other interesting ways to finish the look. It's a beautiful way to make your ensemble look stylish and unique. 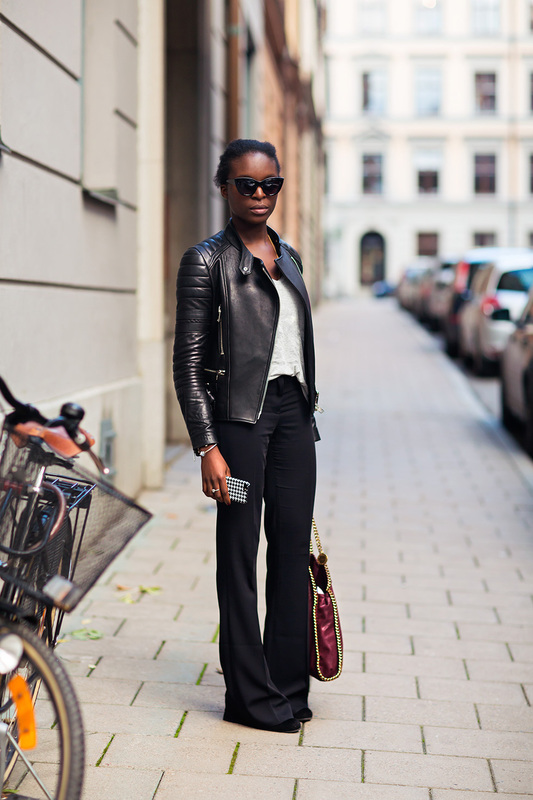 Keep scrolling for an epic roundup of ladies wearing leather jackets with street style outfits. While leather jackets are a symbol of machismo and manliness, the jackets are also widely worn by women.Thanks for sharing this kind of information. I love the look on the fringed black leather jacket on the woman with the wide-brim hat. The colors are simply perfect, especially on the slim waist belt and the plaid checkered dress. That will so suit my squared cowboy boots that I got this Halloween. Styling it with her look would give the vibe of a rough western cross with a tomboyish modern look. Additionally, aviator glasses would suit it well too. I’ll be sure to get one of these jackets since I have a lot of idea for it now. Thanks for the interesting read on some tips on wearing leather jackets!